Like all members of American DJ’s acclaimed Accu Series Intelligent Lighting Effects, the new Accu UFO Pro is – as its name suggests – other-worldly in its breathtaking excitement. With 32 razor sharp red, green, blue and white beams that twist, turn, strobe and pulse, this flying saucer-shaped DMX moving head will fill up the walls, ceiling and floor an entire club or dance floor with a panorama of spacey effects, as it pans up to 540° and tilts 265° with smooth, micro-stepping movements. As electrifying as this sweeping visual display is, what really makes the Accu UFO Pro stand out as a cutting-edge club effect is the source of its light beams: LED lamp technology. In place of a conventional discharge lamp, it’s powered by 32 high-power 1-watt LEDs (8 red, 8 green, 8 blue, 8 white), making it as earth- (and earthling!) friendly as it is out of this world. For all its brightness, the Accu UFO Pro consumes a mere 100 watts of electricity at maximum use, making it a great investment for club owners at a time when energy costs are skyrocketing. Another big user benefit is that it can run all night without duty cycles, thanks to the cool operating temperature of its LEDs. And with a 50,000-hour LED life rating, it requires very little maintenance, saving users time and money on lamp replacement. One thing that the Accu UFO Pro doesn’t hold back on is visual excitement. Its rotating head blasts out 32 sharp red, green, blue and white beams through 12 lenses, which move to the music via stunning internal programs and change colors via built-in macros. This unique moving head also features a variable strobe and pulse effect for even more electrifying action. Multiple units can be linked together Master-Slave via 3-pin XLR cable to cover larger areas. 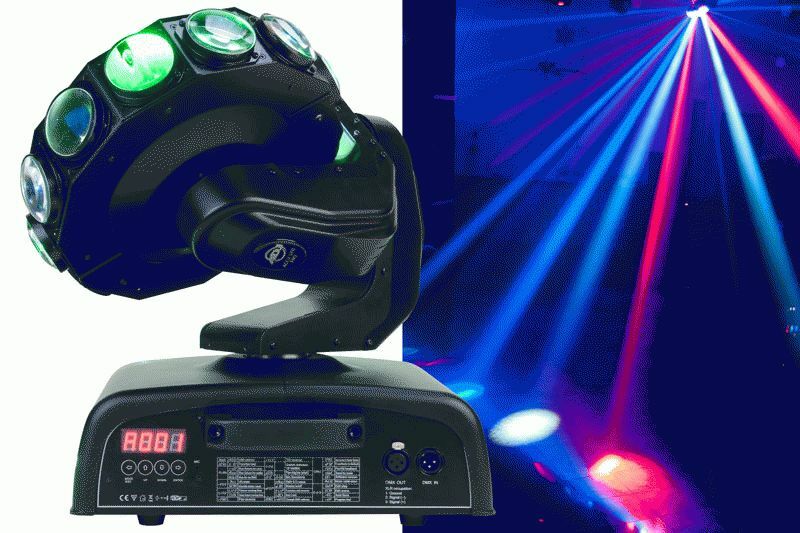 The Accu UFO Pro can also be programmed and run with a DMX controller, using either 8- or 10-channel operation. Users can control Pan/Tilt Speed and Rotation, LED speed, Strobe Effect, Pulse Effect and Colors. It’s simple to set up and control DMX functions, because the Accu UFO Pro allows you to do Remote DMX Addressing (RDMX) right from your controller, and it features a 4-button LED Digital Display for easy navigation through the DMX Menu. Equipped with high-quality 1.8° stepper motors, the Accu UFO Pro has a pan of 360° (8-bit) or 540° (16-bit) and tilt of 265°. It includes a mounting plate for convenient hanging. The MSRP of the Accu UFO Pro is $1,399.95.